At last, the haying is done. Stacked neatly, under cover, ready to feed our critters this winter. The best part of haying is finishing it. Haying is hot, sweaty, dirty, itchy work. We like grain hay for our cows – it can be wheat, barley, oat or a mixture. The cows get lots of roughage, which, since they’re ruminants, is a necessity for their health. The grain gives them lots of extra carbohydrates and some protein. Brood mares or elderly equine retirees get alfalfa or if it’s really good quality, an alfalfa/grass mix. My husband and I both remember hay bales as being much lighter in our youth. And they were, because a baler in those days used two wires – that was before twine displaced baling wire. Bales were narrower as well as shorter, because that’s the way balers were designed in those days. You couldn’t make a two-wire bale much heavier than 80 pounds at the most, because the bales had to be too long to make the weight and they bowed in the middle when you picked them up. Now bales are three strands and they’re wider, so it’s not unusual for bales to average 120 pounds or more. Since that’s the average, there are some that may weigh as much as 140. When you pick up one of those “average” bales, it feels like your insides are going to drop right down to your ankles. The three of us – my daughter, husband and I – have a system. They load and I help unload. I have had to bow to the ravages of time and acknowledge that I can drag those big bales, but I can’t lift them anymore. Many farmers and ranchers who put up hay today never touch a bale. 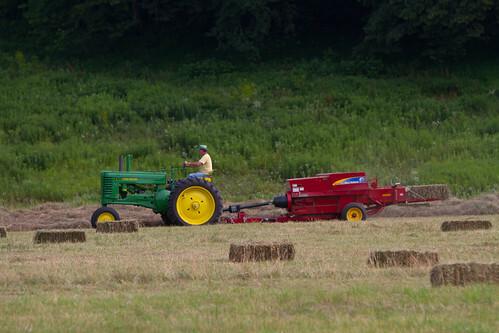 The hay is baled and picked up from the field by a hay wagon or harrowbed. It may be unloaded straight into the stack by the harrowbed or picked up by a squeeze, which is sort of like a giant set of pinchers. Either of these mechanical marvels can handle thirty or more bales at a time. We have neither, don’t have the money for one and wouldn’t have enough use to justify it even if we did have the money, so we do our hay by hand. The rhythm is like a dance: slam the long hay hook into the top of a bale, tumble it from the stack on the trailer, drag it to the end of the trailer. The next step in the dance is my husband’s, as he swings hooks into each end of the bale, heaves the bale up and shoves it into position on the stack. Depending on where we are in the process, our daughter may be part of the tumble and drag or the heave and shove. Tiny face flies, no bigger than a pencil lead, are attracted by the beads of sweat forming on each brow. They are maddening when you can’t let go of a bale to swat at them. Every so often, one of us gasps “Take five!” and we all drop to sit on a bale, swig some water and recharge our batteries for the next round. Hallelujah, the haying is done! Excuse me while I go take a shower and a handful of ibuprofen.